During the “Resident Evil: Damnation” panel at Comic-Con this year, director Makoto Kamiya and producer Hiroyuki Kobayashi shared six minutes of footage from their follow up to “Resident Evil: Degeneration.” I thought the preview was fantastic and conveyed that “Damnation” stayed true to the best selling video game franchise. So much so, I very much look forward to viewing the film in its entirety. In case you missed the write-up about the sneak peak when it was originally posted, you can read about it here. As previously mentioned in the “Resident Evil: Damnation” contest post from Saturday, tomorrow the 3D animated film will be available on Blu-ray and Ultraviolet Digital copy. To get a taste of just how wonderfully disturbing and visually stunning “Damnation” is, Sony graciously shared an exclusive clip with us here at It’s Just Movies. In the clip, we see Leon Scott Kennedy, protagonist from the Resident Evil video game franchise and lead in “Resident Evil: Degeneration,” in a dark room with supporting character J.D. Apparently J.D. is angry with Kennedy for killing his teacher — even though he was infected. During the brief argument, J.D. is grabbed from behind by one of the diseased and tossed aside. To further complicate things, another one of the infected attacks Kennedy, who while fending it off, yells at J.D. to shoot them. But J.D. hesitates allowing himself to be tackled to the ground by one of the infected. What happens next is pretty wild. See for yourself when you click the clip below. Looks very intense, right? If you’re a “Resident Evil” fan like me, then you must add this movie to your collection. The animation is remarkable and the voice work is excellent. 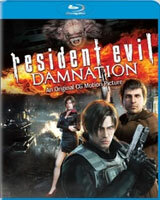 And don’t forget to enter our contest for a great “Resident Evil: Damnation” prize pack. Click here for more details. This looks better than the one that’s in the theater. Looks cool. I need to check this out. This movie was better than the one that was in the theaters.